by the light it is controlling as this can feed back to the photocell and cause a 5 second flashing effect. Dusk to dawn switch photocell light sensitive twilight switches operating at 220-240 volts ac, capable of switching up to 300 watts available with and without an in-line fuse. 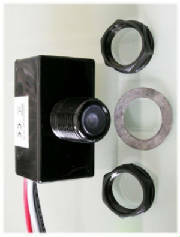 The photocell is usually installed in to an enclosure or light fitting and requires a 20mm mounting hole and offers a waterproof seal by way of 2 securing clamp nuts and a neoprene gasket. Need an wall mount IP44 enclosure ? Go to the bottom of this page. 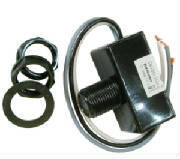 Dusk to dawn switch photocell light sensitive twilight switches available in 2 voltages. The Cyclops is a solid state photocell the 232d operates at 220-240 volt capable of switching loads up to 232 watts and should be protected with a 2 amp fuse, the Cyclops 150d is the 110-120 volt version capable of switching up to 150 watts and should be protected with a 3 amp fuse. Switching device: Philips (BTA 140 Traic 25 amps) suitable for resistive loads or inductive loads with power factor correction. Will operate filament lamps or devices with power factor correction. Dusk to dawn switch photocell light sensitive twilight switches operating at 220-240 volts ac, capable of switching upto 500 watts. Dusk to dawn switch photocell light sensitive twilight switches operating at 110-130 volts ac, capable of switching upto 300 watts. Dusk to dawn switch photocell light sensitive twilight switches with 5A fuse operating at 6 volts dc, capable of switching upto 5 amps (30 watts). 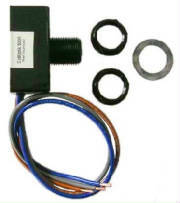 Dusk to dawn switch photocell light sensitive twilight switches with 5A fuse operating at 12 volts dc, capable of switching upto 5 amps (60 watts). Dusk to dawn switch photocell light sensitive twilight switches with 5A fuse operating at 24 volts dc/ac, capable of switching upto 5 amps (120 watts). Dusk to dawn switch timer photocell light sensitive twilight switches operating from a choice of voltages. It has been designed to synchronise with the earths natural solar rhythm to obtain moderatley accurate timing, enabling it to switch off during the night to save energy. A typical example is to turn on at dusk and switch off at midnight, remain off for 4 hours and if still dark switch back on until dawn, thus saving 4 hours of energy per night. The photocell which cannot be changed is fully automated including the summer/winter time shift, therefore use the drop down list to choose your required times. The low voltage versions allow the use of smaller batteries or extends the capacity of existing batteries during overcast days by automatically switching off during the night when not required. Use delivery address	Other see "special request box"
Dusk to Elapse timer switch photocell adjustable time between 5 minutes to 5 hours 20 minutes twilight switches operating from a choice of voltages. The photocel will switch on for 5 minutes when the power is applied. Once it has got dark enough the photocell will switch on for the chosen elapse time selected via the rotary spindle. After this time it will switch off untill the next night when the cycle is repeated. The photocell requires a daylight period to detemine the next night. Applications : Outdoor Shop signage, bus stop signs, garden, home, security, lighting, chicken coops. Dusk to dawn switch photocell adjustable light sensitive twilight switches operating from a choice of voltages. The PondCell 300R has been specifically design to operate pond pumps and fountains during the day and switch them off at night. It is suitable for pumps and foutains up to 300 watts (fused with a maximum fuse rating of 3 amp) and must only be opeated using an RCD (Residule Current Device) for safety. The unit comes with an IP 44 Enclosure, 5 way terminal block, 2 IP68 glands and fixings. Will operate pumps and filament, energy saving and led lamps. Applications : Pond pump, fountain. This enclosure is suitable for all of the CellOptik range but it is not suitable for the Cyclops range. 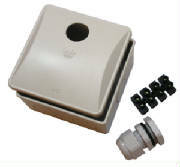 The IP44 rated box has a pre-drilled hole tilted slightly upwards to locate the photocell and is avaliable with one IP68 gland or one gland and a 4 way 10 amp terminal block or two IP68 glands with a 4 way 10 amp terminal block. The rear housing has pre-positioned hole outlines for mounting the glands and these should be drilled using a 20mm dirll. Need a 20mm drill. Applications :Outdoor Shop signage, bus stop signs, garden, home, security, lighting. Contact us if you have any questions, your satifaction is important to us.